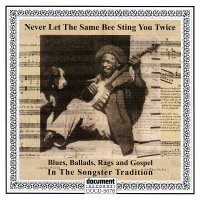 Songster CDs available on Document Records. Before the "blues" was the older tradition of the “songster”. The term ‘songsters’ was originally taken from a ‘songster‘ which was a song book, but the term was adapted by Afro-Americans to mean a singer (often self accompanied by guitar, vocals and harmonica). Songsters were all rounder bluesmen, whose broader repertoire would take in a diverse selection of styles including blues, ballads, ragtime and religious pieces. They were itinerant musicians who would often play with travelling circus’s, minstrel and medicine shows etc. These CDs survey some songsters and their very varied music. Blues, Ballads, Rags and Gospel In The Songster Tradition features a historical showcase of this rich and diverse genre of music. The box set comprises of three CDs with material taken from DOCD-5003 and DOCD-5045 and 28 ‘new’ tracks previously unavailable on Document. The fourteen musicians featured on this set include Eli Framer, Cedar Creek Sheik, Robert Hill, Virgil Childers, Mississippi John Hurt, Big Boy Cleveland and Hambone Willie Newbern who was the first artist to record Roll and Tumble Blues (subsequently recorded by Muddy Waters, available on DOCD-5146 and later covered by 1960s British super group The Cream). The 3 CD box set has been digitally re-mastered, with informative booklet notes written by Chris Smith, full discographical details and new cover art.